I grew up among the dead. My local landscape was inhabited by stories about ancestors who had lived and died in nearby places for centuries. My mental landscape was haunted by ghost stories. I had relatives who ran a funeral parlor only a few minutes’ walk away. But more than these, the dead came into my life through the two cemeteries in town. There was the old cemetery. Appropriately, it was only a minute’s walk away from the funeral parlor. Not that anyone from the funeral parlor was buried there, because the old cemetery had been closed since the end of the nineteenth century. It had been a churchyard cemetery originally. The meeting house (church) had moved away in 1714, but the cemetery remained. It had once contained open tombs, but these had been sealed and covered over, some indeed sealed up by the wall erected around the cemetery in the 1870s. As kids, we saw names and dates inscribed on the granite capstones of that wall, and wondered why people were buried underneath the wall. Inside, slate headstones from 1704 onward predominated, many with the grim death’s head at the top, some with the mellower urn-and-willow design. There were historical markers by some graves, to identify the fellow who rowed Paul Revere across the Charles River on the night of his famous ride in 1775, the woman who led a group who captured a Tory spy during the Revolution, and several of the town’s original founders. There were also metal flag-holders in front of the graves of every veteran. My father had the job of putting American flags on all of their graves just before Memorial Day (which commemorates the nation’s war dead), but he made it a game with his children, and we all rushed about the cemetery trying to place as many flags as possible. That task led to me writing my first supernatural story, when I was in fifth grade. For years, there had been one veteran’s grave we could never find, even by reading the headstones. So I composed what I considered a creepy story about how the gravestone appeared and disappeared on Halloween, a Brigadoon of the dead. One year a plane was flying overhead when the gravestone disappeared, and the airplane was lost, too! I thought it was impressive, then. And it did give one of my classmates the creeps. Oh, the missing grave? We did eventually find it. There was a slate stone with a very long inscription, which turned out to mark two graves, that of a mother and her son, the veteran. His name only appeared halfway through the inscription. So much for the mystery. But I don’t set foot in that cemetery on Halloween. The “new” cemetery had been around since 1847. It was about a ten minute walk from my home, but in a direction we rarely went on foot, so it was less familiar. Garden cemeteries were all the fashion after Mount Auburn Cemetery had been founded in Cambridge, Massachusetts in 1831, so the new cemetery was planned as another garden cemetery. But the people of my home town were not as rich as the founders of Mt. Auburn, so the new cemetery was a weak imitation. You walked in through the impressive stone gate, saw a grassy lot directly in front of you, and the grounds swept up the hill, with a winding path to take you to the top. But any attempt to cultivate a garden had long been abandoned, and the fence around the cemetery consisted of granite posts joined by rotting (or missing) wooden timbers. Still, this was where my family was buried. 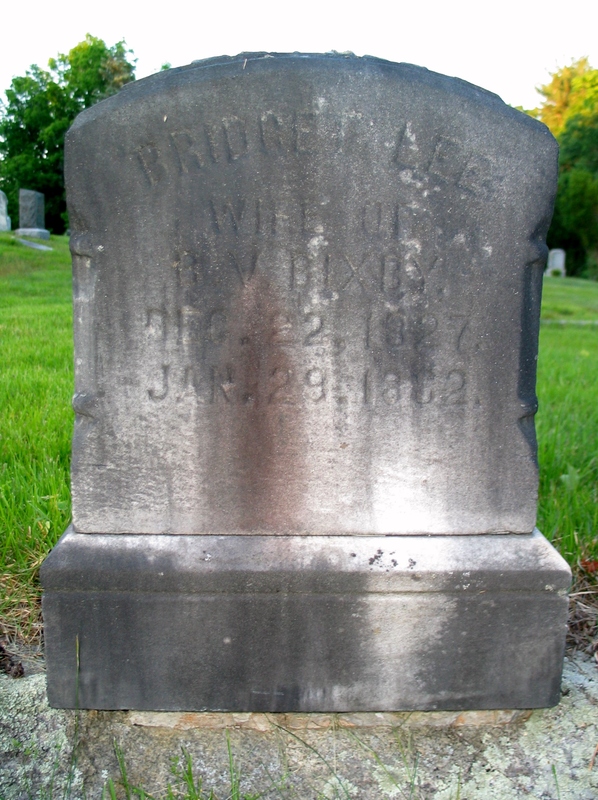 My great-grandmother, Bridget Lee Bixby, whom I mentioned in an earlier post? That’s where her grave is. Along with her husband and many of her descendants, which since 2001 have included my father. 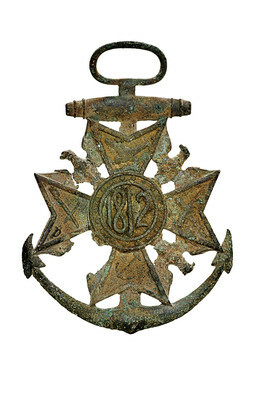 And there were more metal flag-holders there, with different designs for each war, and a unique one for the only sailor from the War of 1812 buried in the cemetery. That war was unpopular in New England, and my home town wasn’t on the coast, so it’s not surprising there was only one such marker. And it was a fancy one, too. I often wanted to take it away with me! As I got older, I became more curious about burial and memorial customs. I even squeezed several books on the subject into my doctoral research. Turns out there is a lot one can learn from visiting cemeteries. 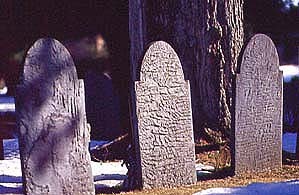 The slate graves of early New England were locally produced, while the marble stones only came into fashion as status symbols in the mid-nineteenth century. Death’s heads represented mortality, while the urn-and-willow demonstrated a shift to a more sentimental and hopeful view about death. Elaborate inscriptions or pictures all but disappear off granite stones for much of the twentieth century due to the cost of inscriptions, but declining costs have led to a resurgence in memorial art on stones in recent decades. The (U.S.) Association for Gravestone Studies holds an annual conference each year to discuss research. Even though I’m become more scholarly about cemeteries, I still can shudder when they crop up in horror stories. 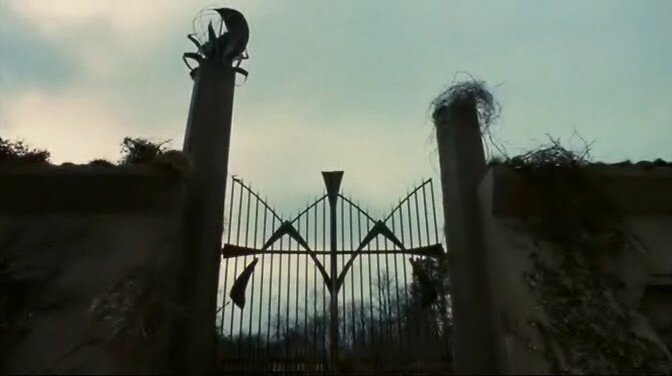 Clive Barker wrote a horror story called “Cabal” (circa 1988) about revenants, subsequently turned into a movie called Nightbreed, that features an enormous cemetery called Midian. It looked so fascinating in the movie version that I wanted to go visit . . . in the daytime. This entry was posted in Uncategorized and tagged cemetery, dead, Fiction, gravestone, Halloween, History, horror, memoir, Reminiscence, supernatural, Writing. Bookmark the permalink. Influences, yours clearly were here. Now that I’ve had some time at home and could actually read the Wikipedia entry . . . intriguing. The cemetery plays a critical role, which is in keeping with what you’ve described as Ansky’s previous work. Thanks for making the connection. I’d need to read up considerably more on European spiritualism before 1914 to answer your last poser, Dana. Given the Russian habit of borrowing extensively from French and English culture in that era (a point I’m appreciating while reading “Anna Karenina”), I wouldn’t be surprised, but I don’t know the details. Have to see what sort of books I can dig up in Widener. I’ve looked into the matter, Dana. There were definitely connections between pre-revolutionary Russian intellectuals and the Western European mystical literature of the time, and Jewish mysticism figured in there, too. Russian intellectuals read the spiritualist literature coming out of England; indeed, the medium in Tolstoy’s “Anna Karenina” is based on the medium Daniel Dunglas Home. They were also influence by French occultists both directly and via the Symbolists in the art world. Finally, a few Russian intellectuals did develop an interest in Jewish mysticism, specifically seeing it as older than Christianity, and engaged in dialogue with Jewish scholars of the occult living in Russia. This is fascinating! Thanks so much for looking into it! It’s nice to be able to take advantage of the world’s largest university library! Beginning of, of course 😦 Anyhow, Shelly says a lot has been published about Ansky in the recent years. So, if your’e intrigued, yoi’ll probably find something about it. As for me, I love looking for connections, or as my Cali friends like to say, interconnectedness of things… but I don’t have to have a definite answer.